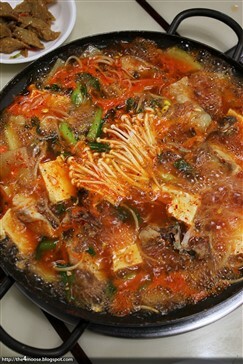 Dongtae-jjigae is a stew made from frozen pollocks. Pollocks have a firm and chewy texture and have nice savoury tastes. The stew can have a lot of gochujang or none at all according to personal preferences. 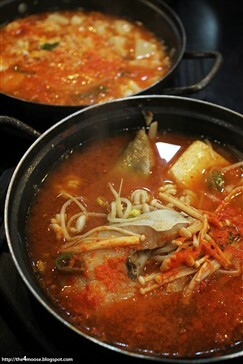 Dongtae-jjigae is a popular fish stew inKorea. The pollocks are cooked in a clear broth. Radish, green onions, tofu, beans sprouts, anchovies and dashi are added to the broth. Spices like ginger, garlic, gochujang andsoybean paste are used to season the stew. A chrysanthemum herb called crowndaisy can also be added to give the stew a herb-like flavour. When made with fresh pollocks, the stew is called saengtae-jjigae. The warmth of the stew and its spiciness makes it perfect for warming up during winter. Garnish with green onions and serve warm with steamed rice, Kimchi and other side dishes of choice.